The stunning Northern Lights would be visible from different parts of the United Kingdom over the weekend. There are 20% to 30% chances of spotting the Aurora Borealis coming from the south on March 23 due to a space storm caused on the surface of the sun. On Wednesday, the sun let off an explosion from a new sunspot, firing a small solar flare that lasted for an hour. The blast even resulted in disruptions to radio operators in Europe and Africa. It was caused by the movement of a giant cloud of charged particles known as coronal mass ejection (CME). The particles colliding on the Earth's magnetic field could turn up the range and intensity of the Aurora. They are caused by charged particles interacting with the nitrogen and oxygen in the Earth’s atmosphere producing green coloured lights across the sky. Northern Lights are caused by the particles from the sun flowing constantly toward the Earth and a CME could put up a big show up there. The National Oceanic and Atmospheric Administration predicted that in North America, the Aurora Borealis be clearly visible in New York and Chicago on March 23 most likely in the early morning hours. Meteorologist Joe Charlevoix tweeted that the Northern Lights is likely to be visible on Saturday night. 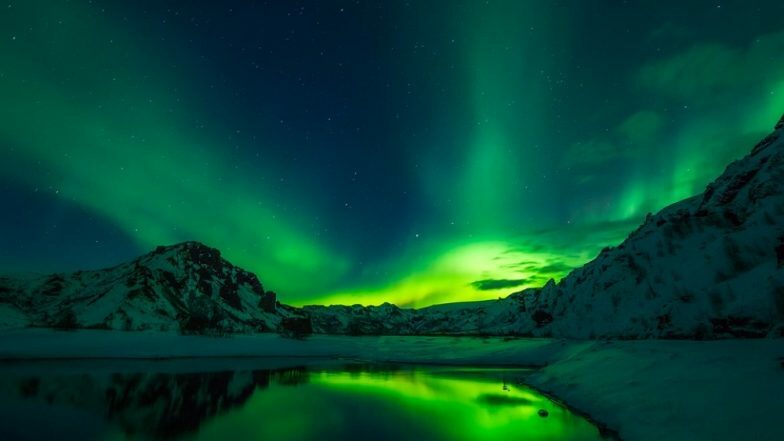 Amazed by Aurora Borealis Pics? Scientists Study How the Beautiful Phenomenon of Northern Lights Occur. Met Office Space tweeted that the Auroras could be visible anywhere above Cumbria if weather conditions are favourable. Iceland, Norway, and Alaska receive thousands of tourists who arrive to see the Northern Lights. Those planning to catch the stunning celestial event live are advised to move away from city lights for a clearer view. Super Snow Moon 2019 Pictures: Check First Glimpses of The Biggest Supermoon of The Year. A spokesperson for The Met Office Space Weather Operations Centre said, "CME forecast to arrive late 23rd March following C5 flare from sunspot AR2736. Active-minor geomagnetic storm periods possible with low risk of moderate storms. As a result, Aurora may be visible in Scotland where cloud breaks." The sun did not witness a visible sunspot in 2018 or this year until now. This is a potential indication that the sun is becoming a little more active.